La Belle Vie: Priscilla's Pick!! Apparently Priscilla knows me even better than my husband. Well done!! I chose the first one. It wasn't within budget, but we managed to get them down to $150, from $178. The man said my mom bargained like an easterner. We're not sure what that means, but he definately pegged her as an original Ontario resident. 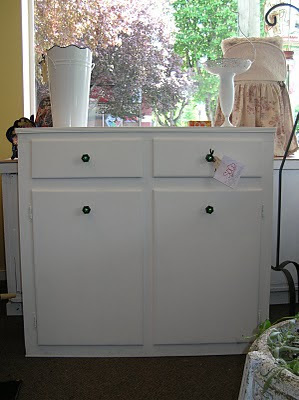 One of my highly pretentious reasons was it didn't look like a dresser. I have huge objections to conformity and always like to have something 'different'. I'm very annoying to live with. It's an obnoxious trait. Aside from the fact it's unique, it is very thin. The less intrusive into our oddly shaped room the better! Plus it's extremely simple. I wanted something that wouldn't over power the verticle lines of the beadboarding. I still need to paint it, and I may change the green glass knobs. With only four knobs, I can afford to be a bit extravagant if I choose. I do like the green glass though. It actually holds decent storage and it reminds me of the toy cabinet in Mary Poppins. Sigh... I'd trade a kidney to be Mary Poppins. She was a diva. Also featured above are my highchair and craft table for the wee one. Shopping in my parents basement is the true defintion of a bargain basement. The highchair was built by my grandfather for my mother 60 years ago! I mean forty years ago, wink, wink. Still it's in great condition. My brother and I both used it when we were young, as did my niece. 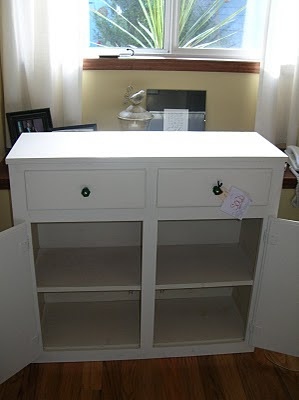 My parents are sanding it down and painting it white, and I am so excited! We have a Vancouver sized apartment, so everything in it really needs to blend in. My mom's making a cushion as well so he's cozy as can be in there! The table was a great find at a school fair a few years for $4. Some paint and a few decals and my mom had it looking fantastic! I'm going to replace the decals, but I think our bambino will enjoy lots of craft time at it! I love cheap finds. I live for them!! So there you have my Island treasures. I can't wait for them to start filling up the nursery! The fact our baby room will one day actually have a baby in it is truly incredible to me. Until then, preparing for them is quite the treat! I knew it - yesssss! Well, I SORTA picked the right one - I chose #1 and #3, though ended up thinking that you'd choose #3 because that's what most people thought (teaches me to cave to peer pressure when my gut was saying something different). 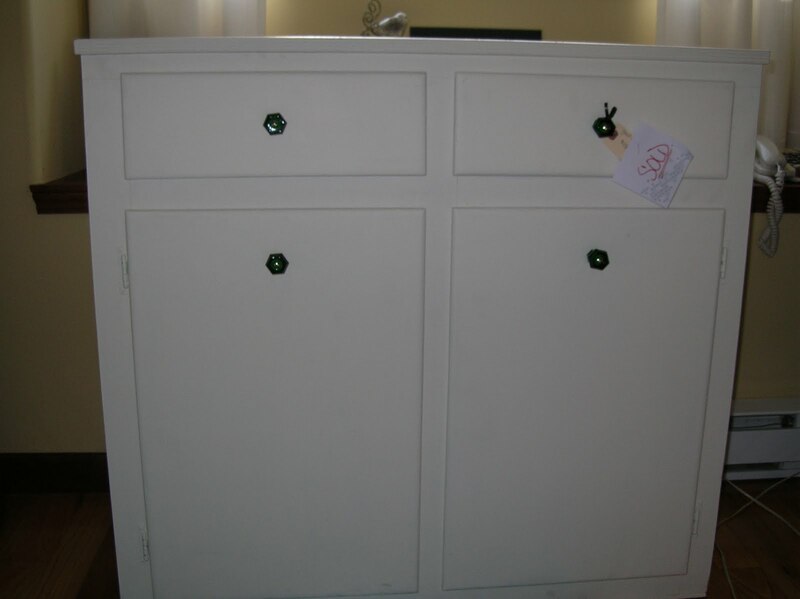 My personal favourite was #1 because of the knobs (which don't look green on the photos), so I'm privately delighted you chose that one! 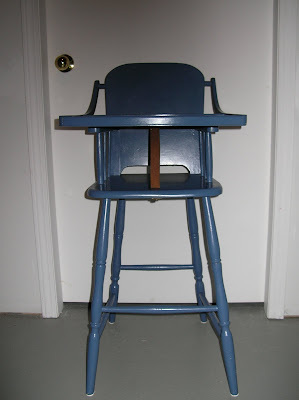 Quick question...I love the wooden highchair and have seen them every once in a while in second hand/vintage stores but was worried about safety issues. Ie. you know how every week they are recalling a stroller, crib, etc. Is a highchair something that is relatively safe to use in the old style? I just hate the idea of having one of the monster style plastic ones in my dining room if I don't have to. Thoughts? You were very close Ruth!! Very, very close! Anya, sadly only one chair but I will keep my eyes peeled for another one for Uncle Will. Kirsten, from my own research I haven't found anything that indicates this one will be unsafe. It doesn't have a belt around the waist, so I'm going to buy a safety belt for that. Other than that, it should be fine. I think you have to appraise each one individually. 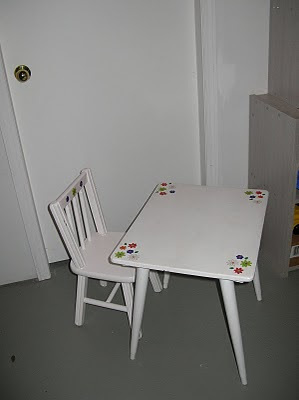 Same rules for new high chairs should apply. Double straps, but not attached to the tray. It needs to be sturdy. No sharp edges or anything they can get their hands and feet stuck in. My only concern was them standing up in it, which won't happen when they're properly strapped in.